Mascar will not miss the 43rd edition of EIMA International where all our staff will be ready to welcome you and illustrate our latest news. You will find us in Hall 26, both A/15 on exhibition space. For us it is a special occasion, because this year marks our 20th anniversary of activity. 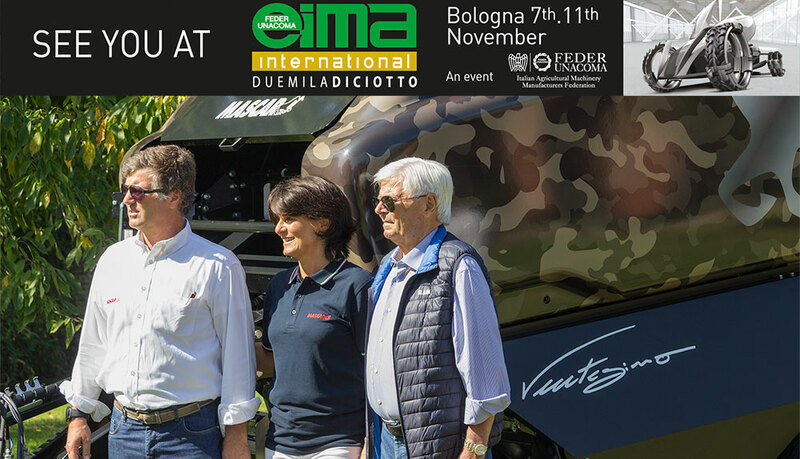 EIMA International is confirmed as one of the most important events in the world for agricultural mechanization, agriculture, green care and components. Among our new products you will find the new cutting system CUT.25 that will fit the Diavel 630 and Diavel 630 Multiwrap fixed chamber balers. You’ll be able to see our latest products from the Maxi-5 pneumatic seed drills with some important technical innovations. We will show you the double-roller system film for the 3100S trailed wrapper. The innovative Montana pneumatic seed drill, presented at Agritechnica 2017, will also be on the show. Do not miss to see all the other models of the Mascar production that we will bring to the review, we also expect some surprises that this year we have prepared especially for you. The EIMA 2018 audience expectations will be amazing, in fact, record numbers are expected, surpassing the previous edition that has counted on 285,000 visitors from 150 countries. Also attracting attention are the six thematic halls that take place inside EIMA: it is EIMA Components, EIMA Green, EIMA Idrotech, EIMA Energy, EIMA Digital and EIMA M.i.A. It is also recommended to look at the video on the roads in the days of EIMA, which can be very useful in order to arrive and leave the exhibition complex in an easy way; you can find it by clicking here: Video via EIMA 2018. You can contact us at info@mascar.it or by calling +39-(0)444380180.